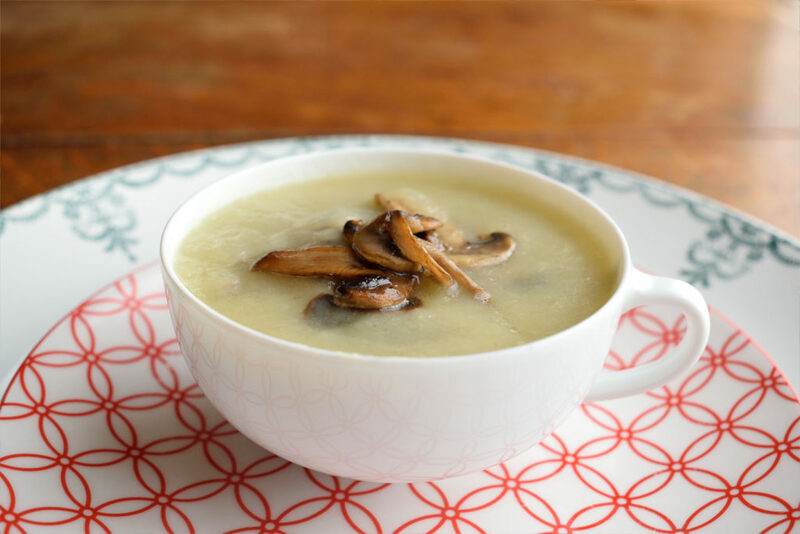 This sunchoke soup with mushrooms, has a lovely earthy taste. 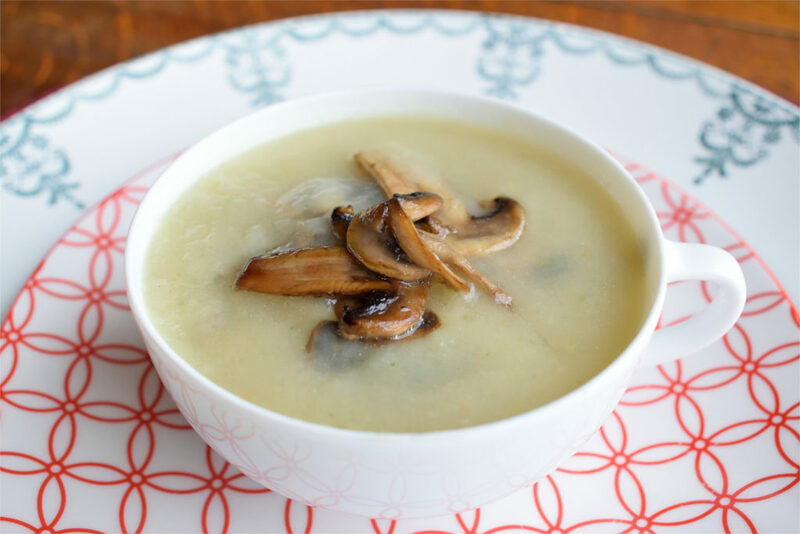 The nut-like taste of the sunchokes goes very well with the earthy taste of button mushrooms. A tasty, warming soup with plenty of umami. Sunchokes are a root vegetable, known under a lot of different names. Jerusalem artichoke is the most common one but names like sunroot, earth apple or topinambour are also possible. The Italian name for the plant is “girasole articiocco”, which means “sunflower artichoke”. Which is probably where the name sunchoke comes from. Sunchokes originally come from North-America and aren’t actually artichokes at all. They are however related to sunflowers, so at least that part of the name is correct. Like sunflowers, sunchokes are tall plants. They can grow up to 2 to 3 metres tall (six to ten feet). They have large leaves but the yellow flowers at the top are pretty small in comparison. Sunchokes taste quite sweet with an earthy, nutty kind of undertone. 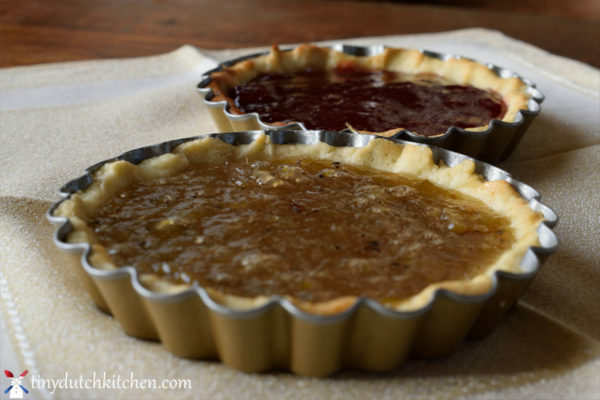 They do well in all kinds of dishes, from purée to pizza. You can also eat them raw but this might not be a good idea for everyone. Jerusalem artichokes contain inuline, which the human digestive system can not break down. The results are a bit smelly. 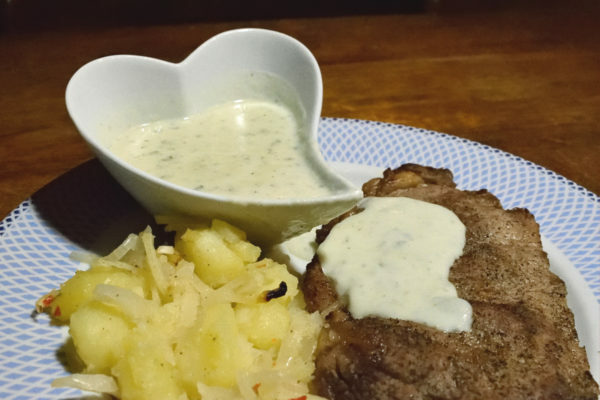 Which is why the vegetable has the nickname “fartichoke”. Peeling and cooking them before eating, will greatly reduce this effect though. 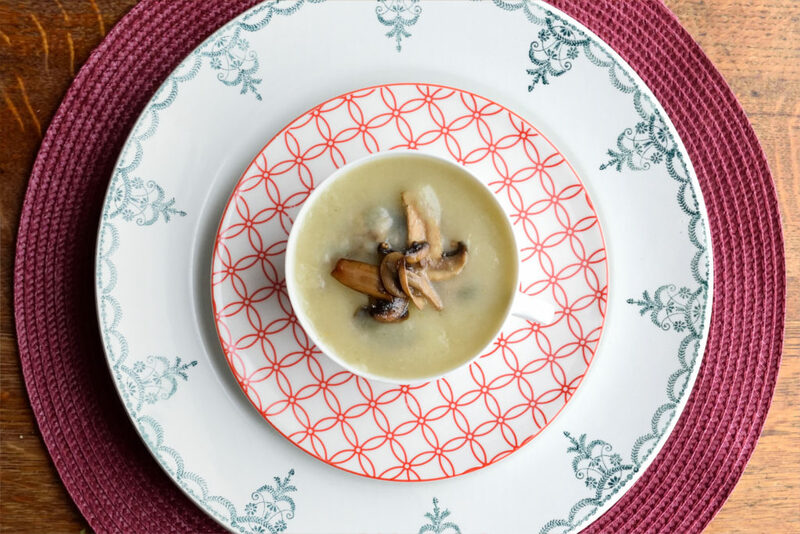 In this sunchoke soup with mushrooms , the sunchoke’s nut-like taste is goes very well with the earthy taste of the button mushrooms. Mushrooms also provide a lot of the umami taste. Technically speaking, umami is the taste of glutamate. But let’s be honest, that doesn’t sound very nice. 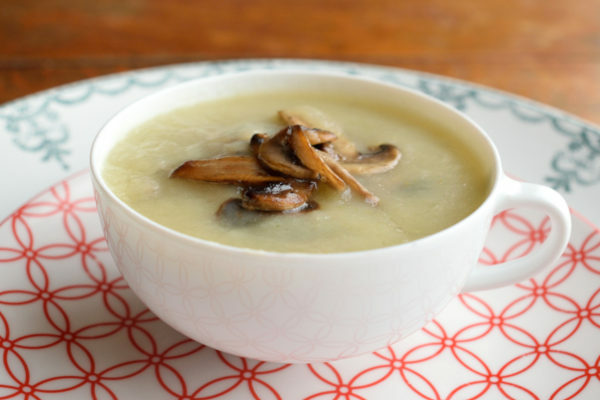 Basically, umami is the savory taste found in broths, seared meats and ofcourse mushrooms. Wash and peel the Jerusalem artichokes and cut them into even sized chunks. Add them to a large pan. 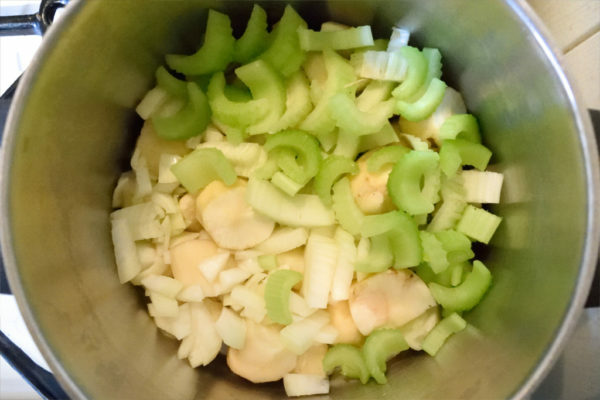 Finely cut the onion and celery stalks and add them to the pan as well. Finally add the stock and bring everything to a boil. Cook the soup until the Jerusalem artichokes are soft. Meanwhile, cut the mushrooms into thin slices. 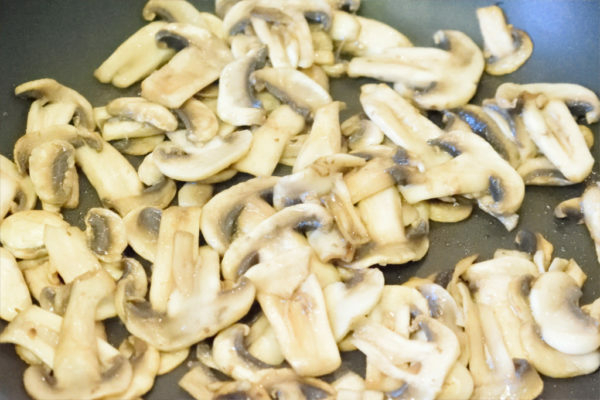 In a separate pan, cook the mushrooms in a little bit of oil. Cook them until they've reduced a little bit and have a bit of colour. Set them aside for now. 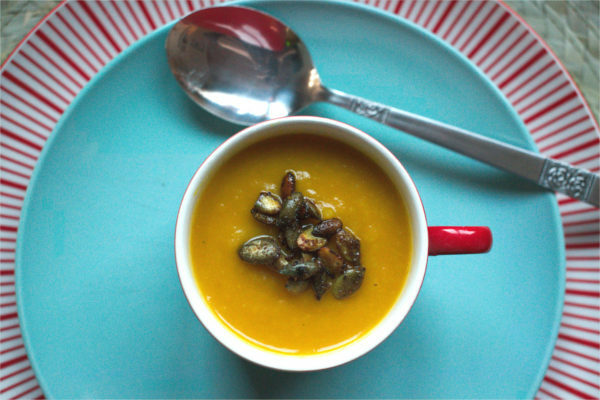 Once the Jerusalem artichokes are soft, take the soup of the heat. 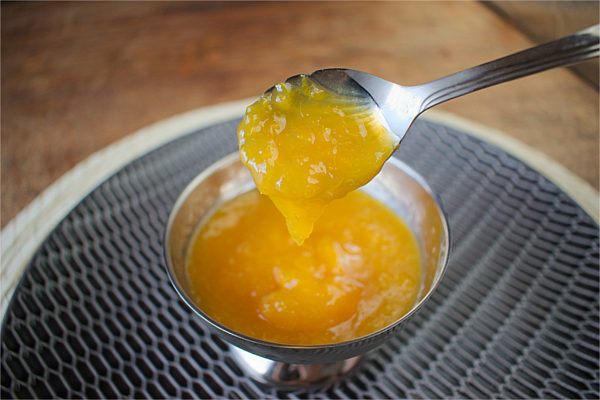 Using a (hand)blender, blend the soup until smooth. 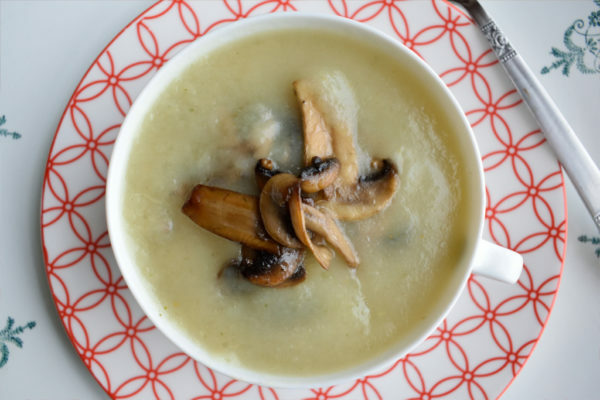 Add the mushroom slices to the soup and warm through. Season to taste with some freshly ground black pepper and serve!